This is the other dessert The Husband made yesterday. 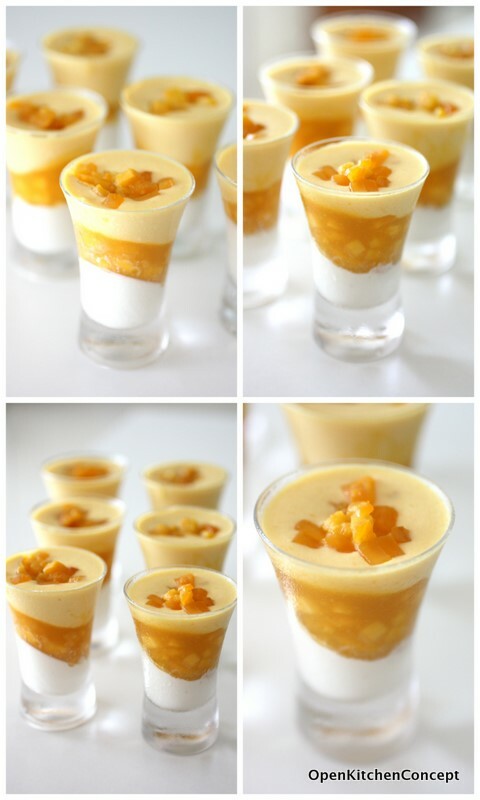 There are 3 layers in this dessert - vanilla panna cotta at the bottom, mango cubes in the middle and mango mousse on the top. My favourite is the panna cotta layer - silky smooth with real vanilla beans. Quick! Go open a dessert shop!! Check out Gobi and see if you can tweak the concept. Go! Go! Go! I come eat. Hehe. Thanks Petunia! I just went to Gobi today.. Was just going to blog about it. Yes i saw your this post yesterday and went to buy some mangoes home. So irrestable!! The husband made??? WOw! so neat arrangement!